The color of the urine sample is assessed subjectively and reported as red, brown, yellow, etc, or combination thereof, along with a modifier for the depth of color, eg, light yellow, dark red/brown, etc. Some examples of various urine colors and corresponding common causes are shown below (this is not an exhaustive list – there are many other substances, including drugs, which can influence urine color). The turbidity of the urine sample is gauged subjectively and reported using the descriptors: clear, slightly cloudy, cloudy, opaque, or flocculent. Normally, fresh urine is clear to very slightly cloudy. 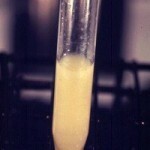 Excess turbidity results from the presence of suspended particles in the urine. The cause can usually be determined based on the results of a microscopic urine sediment examination.